This article is about characters in J. R. R. Tolkien's legendarium. For Norse mythology, see Durinn. For the Shannara character, see Durin Elessedil. For the village in Iran, see Durin, Iran. Durin is the name of seven Kings of Dwarves in J. R. R. Tolkien's legendarium. They were held by the Dwarves to be the reincarnations of the first one, Durin the Deathless, resembling him in appearance and said to have preserved memories of their 'earlier lives'. Tolkien took the name Durin, like most of the dwarf names in his works, from Norse mythology. This he later explained by the translation fiction: since Tolkien's invented language of Westron was translated with English, the language of Dale, used by Dwarves for their "outer" names, was translated with Old Norse. One way the Old Norse term durinn can be translated is "sleepy",  which aptly features in the legends of the origins and ultimate fate of Durin the Deathless. 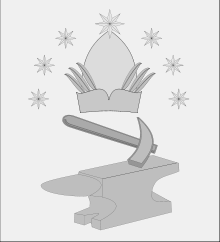 Durin's emblem as described on the Doors of Durin. Durin the Deathless was the eldest of the Seven Fathers of the Dwarves. Durin was created by Aulë the Vala during the Years of the Trees. He was named "the Deathless" as he lived to a far greater age than any other Dwarf, and he was revered by all Dwarves as the eldest of their race. Each of the seven Fathers founded a clan of Dwarves. Durin's clan was called the Longbeards and Durin's folk. According to the traditions of the Dwarves, Durin was set to sleep alone beneath Mount Gundabad in the northern Misty Mountains; Gundabad remained a sacred place to them ever after. He awakened some time after the creation of the Elves in Y.T. 1050, and according to an early version of the story travelled great distances to other Dwarf kindreds, where other Dwarves joined him. He arrived at the Mirrormere, a marvellous lake in a great valley in the central Misty Mountains. In caves at the base of Celebdil, a massive peak that formed the western wall of the valley, Durin founded what became the greatest and richest of the Mansions of the Dwarves: Khazad-dûm (the Dwarrowdelf), afterward called Moria. Durin I was the first King of Khazad-dûm. Some important places in Khazad-d��m were named after this Durin: Durin's Stone, Durin's Bridge and probably Durin's Tower. Durin the Deathless was also commemorated in Durin's Crown (the constellation, artefact and emblem), and Durin's Day (the name of Khazad-dûm's golden age and of the Dwarvish New Year). Durin the Deathless was buried in a secret tomb in Khazad-dûm. The Dwarves regarded him as in longeval "sleep" rather than dead: a book-end to his long primeval sleep, from which he would likewise ultimately awake. In the published version of the story, Durin died before the end of the First Age. An early version of Appendix B ("The Tale of Years") had him leading Dwarves from the ruin of Beleriand to found Khazad-dûm at the beginning of the Second Age; but Tolkien abandoned that line. After Durin died, Khazad-dûm was ruled by "many generations" of his descendants, until the Balrog appeared in Moria. In this long line, Tolkien writes, there appeared occasionally "an heir so like to his Forefather that he received the name of Durin." More complete versions of the account of Durin's Folk make clear that the later Durins appeared scattered amongst many generations. These six further Durins were believed by the Dwarves to be reincarnations (or even reanimations) of Durin I, with memories of his earlier lives. In T.A. 2989, during the unsuccessful attempt to recolonize Moria, Balin's party evidently found Durin's Axe. Though not stated in the text, many Tolkien scholars have concluded that this was an heirloom lost when Durin VI was killed by the Balrog in T.A. 1981 (A helm is also mentioned, not identified in the text as Durin's, from which some have conjectured "Durin's Helm" as well.) The Axe was evidently lost again when Balin's party was killed in T.A. 2994. Foster suggests that this is the Durin named on the West-gate of Moria. The gate was built during the alliance with the neighbouring Elf-realm of Eregion, which was established circa S.A. 750. He was King of Khazad-dûm circa S.A. 1600, and was the first bearer of one of the Seven Rings (a fact not widely known until the end of the Third Age). The Dwarves believed he had been given his ring by Celebrimbor and not by Sauron, though Sauron was involved in the making. Celebrimbor was the lord of the Elven-smiths of Eregion, which was subsequently besieged in the War of the Elves and Sauron. In 1697 Celebrimbor was killed, and Durin III sent an army into the conflict. Neither the dwarves nor an additional army led by Elrond was able to prevent the destruction of Eregion, though some Elves were able to escape. Durin then withdrew his people into Khazad-dûm and shut the gates. He would have lived in Khazad-dûm in the late Second or early Third Age, but Tolkien records nothing of his reign. A persistent rumour on the Web holds that Durin IV was the king who led the Dwarves from Khazad-dûm to fight against Sauron with the Last Alliance at the end of the Second Age. Tolkien indicates that Dwarves of Durin's Folk did fight with the Last Alliance, but he does not say under which king they fought. Tolkien records nothing of his reign. Durin VI was King of the Dwarves of Khazad-dûm in the Third Age, when their deep mining for mithril under Caradhras aroused a Balrog from its hiding place in the depths. The Balrog killed Durin in T.A. 1980, and became known as Durin's Bane. Durin was succeeded by his son, Náin I, whom the Balrog killed in the following year. Moria was then abandoned by its people. Durin VII or Durin the Last was the direct descendant of king Thorin III Stonehelm (according to some sources, his son), ruler of Erebor and the Iron Hills in the Fourth Age. His birth was apparently prophesied upon the accession of Dáin II after the Battle of Five Armies (although no record exists of the actual prophecy itself). He led Durin's Folk back to recolonize Khazad-dûm (Moria) at some (unspecified) time after the beginning of the Fourth Age, where they remained "until the world grew old and the Dwarves failed and the days of Durin's race were ended". ^ The Peoples of Middle-earth, p. 322. ^ The Return of the King, Appendix A, part III. ^ The Peoples of Middle-earth, p. 173. ^ The Return of the King, Appendix A, (III) "Durin's Folk". ^ The Peoples of Middle-earth, pp. 275, 279, 383. ^ The Peoples of Middle-earth, pp. 383-4. ^ Robert Foster, Guide to Middle-earth, "Durin's Axe". ^ The Lord of the Rings, A Reader's Companion, p. 281: reference to p. 306 in LOTR. ^ Robert Foster. The Complete Guide to Middle-earth, "Durin II". ^ The Silmarillion, "Of the Rings of Power and the Third Age", p. 294. ^ The Peoples of Middle-earth: "The Making of Appendix A", '(iv) Durin's Folk', p. 383.